Any time pets are forced out of their routine and made to face an unfamiliar scenario; there are chances that the animal, whether cat, dog, or hamster can get injured suffering physical or psychological stress. 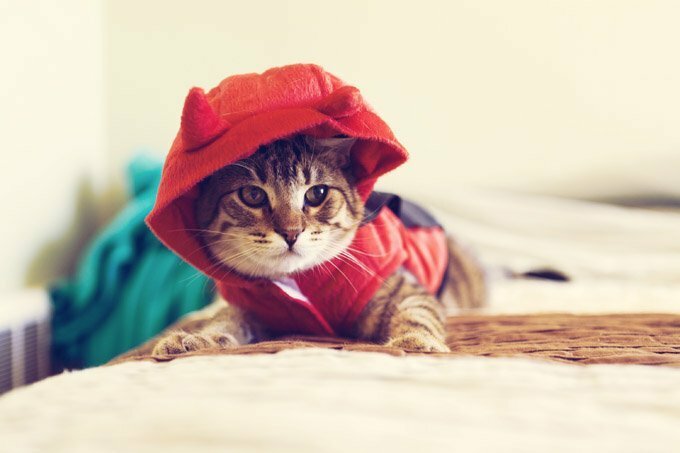 Many injuries that are reported to the veterinary clinics on the days following Halloween are avoidable with a little bit of understanding and information on part of the pet parents. Simple things can make a difference, for example, taking your pet dog out for a walk before the trick-or-treaters start coming in. Be sure that the animal is on a firm leash as it may get startled on seeing people in costumes. At home, keep the dog secluded till the traffic to your place is over. Kids can unknowingly injure an animal in their enthusiasm; candy and chocolates offered to cats and dogs can actually prove toxic, particularly to the small breeds. Theobromine in chocolates is toxic to the system of these animals. Symptoms of theobromine poisoning include pupil dilation, hyperactivity, rapid heartbeats, coma, and muscle seizures. Dogs can get excited and run after trick or treaters. They risk accident and also theft if they step outside the front yard. If your pet is easily excitable or can get jumpy from sudden noises and being exposed to new sights and smells, there is a chance that it may hurt not only itself but also lash out or scratch others. Confine your animal in a large enough crate if you cannot spare a room. Give your pet dog its favorite bone, play soothing music, supply it with water, in short make the animal comfortable before the humans start partying. Putting an I.D. tag on your pet is a great idea to make identification and retrieval easy should it ever run loose. It is worth reiterating that chocolates and candies are not for the pets. Keep them away from even the crumbs. All treats can be potentially lethal to the pets. Decorations and jack-o-lanterns are injury and fire hazards for frisky, curious, and energetic pets. Ditto for wire cords, tin foil, and cellophane. Don’t force your pet into a costume unless you are very sure of its comfort. It may be an hour or two of fun for us but the time will pass very slowly for the suffering animal. If you have to do it and are sure that the animal will not become high strung then try out the costume beforehand. The animal should be able to breathe comfortably and vocalize easily. Avoid making them wear masks. If your pet gets too nervous from sudden sounds, noise, and revelry then you should check with the vet if sedating the animal for the night is an option.